In their first election under new federally mandated voting districts, residents of San Juan County, Utah, on June 26 ousted incumbent commissioner Rebecca Benally. Final election results are expected to be posted by July 10, but preliminary results for the Democratic primary in Commission District 3 show Kenneth Maryboy with 51.5 percent of the votes, landing him the nomination over Benally. He won by 42 votes. Both Maryboy, who has been a commissioner in the past, and Benally are members of the Navajo Nation. However, Benally, though a Democrat, almost always sided with the two Republicans on the commission. Her loss may be a sign that things are changing in the politically divided county. There is no Republican candidate for the District 3 commission race, meaning Maryboy appears to have captured the seat. In the race for the Republican slot in the District 1, incumbent Bruce Adams won handily over challenger Logan Monson, by a 102-vote margin. In 2016, U.S. District Judge Robert Shelby ruled that all three commission districts were unconstitutional, as well as the five school-board districts. The ruling came after a long history of disputes over representation for Navajos in San Juan County. In 1983, the county agreed to eliminate at-large voting. One district has yielded a Navajo representative on the commission ever since then. 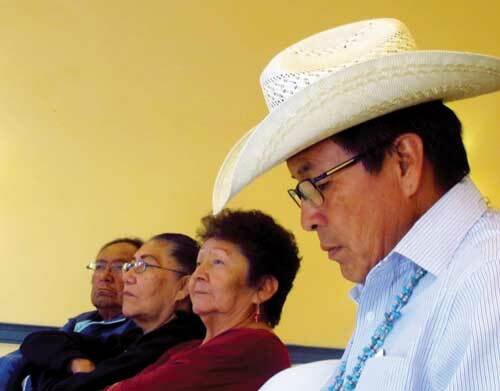 But, as time went on and demographics changed, Navajos began to chafe at the fact that they could never gain a majority on the commission even though Native residents outnumbered Anglos by a slight margin in the 2010 census. Ninety-three percent of the residents in that now-eradicated district were Navajo, but only 30 percent of the voters in the other two districts were. That led to Shelby’s ruling and a redrawing of the districts. Now, for the first time in San Juan County history, voters are positioned to tip the balance of governance away from the predominantly Anglo, Republican party toward the Democratic party. The new commission districts establish a 11.1 percent Native population in District 1, 65.6 percent in District 2, and 79.9 percent in District 3. Turnout was high for the primary. “I think the voter-registration effort paid off. We’ve now registered over 300 voters in the county,” James Adakai, president of the San Juan County Democrats, told the Four Corners Free Press. Native voters tend to vote Democrat, he said. But two legal questions are swirling around the coming election. One involves the Democratic candidate in District 2, the only district in which there will be both a Republican and a Democratic candidate in the general election. Incumbent Phil Lyman, a Republican, opted not to run to retain his seat. Instead, he is seeking to be elected to the state House. Kelly Laws, the father of county attorney Kendall Laws, is the Republican candidate in District 2. 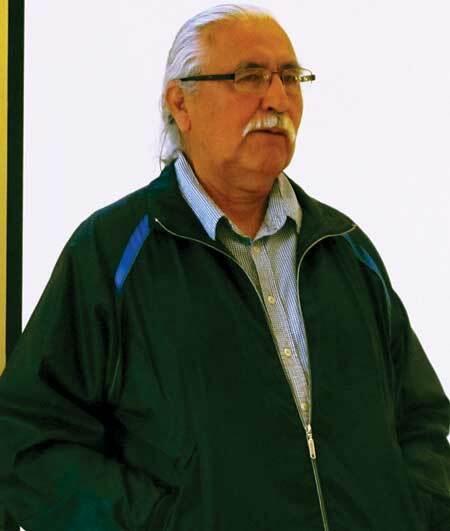 Willie Grayeyes, a resident of the Navajo Mountain community in Utah, was chosen at the Democrats’ caucus in March to be their candidate in District 2. But shortly after the caucus, San Juan County Clerk/ Auditor John David Nielson sent Grayeyes a letter demanding that Grayeyes prove his residency, the result of a challenge by an Anglo county resident. As part of his response, Grayeyes invited the clerk to meet at this Navajo Mountain residence, where his family has lived since time immemorial, Grayeyes said in a press release. He sent the coordinates showing his residence on the satellite map and its relationship to the Arizona-Utah border. His home in the Navajo Nation reservation is within Utah’s boundaries. His umbilical cord, buried in a traditional Navajo birth ritual, is at the site. Grayeyes sent Nielson the information and a record of his longtime voter registration, a copy of his 1946 birth certificate and a document showing his cattle-ranching operations in the region. The state elections director confirmed he’d cast ballots for 26 years in Utah elections, too, and Adakai vouched for his Utah residency of at least 34 years. But Nielson was not appeased. By May, the issue was not resolved. In a letter dated May 4, Nielson wrote that there was “clear and convincing evidence” that Grayeyes was NOT a county resident. Nielson said a sheriff’s deputy visited the property Grayeyes listed on his candidacy form. The dirt driveway did not have recent tire tracks or footprints. No one answered the door. The letter suggested that Grayeyes resides in Tuba City, Ariz., where he maintains a post-office box. “I find that this evidence sufficiently rebuts the presumption of residency arising from your previous voter status,” Nielson wrote. Lena Fowler, a member of the Coconino County, Ariz., Board of Supervisors representing the Arizona portion of Navajo Mountain, said in a declaration that Grayeyes resides in the Utah portion of Navajo Mountain. He is not registered to vote in Arizona and never has been, she said. But Nielson struck Grayeyes’ name from the county’s voting rolls, claiming that Grayeyes is not a resident of Utah and not qualified to run for a seat on the commission in 2018. Attorneys for Grayeyes filed a lawsuit in June, alleging that the disqualification was put together by conservative, white members of the county as an attack on Grayeyes’ race and political views. In a press release, Steve Boos, Grayeyes’ lawyer, explained that the lawsuit calls for the county to reinstate his candidacy. Boos accused it of launching a racially politically motivated attack. A court date is set for late July. If the court keeps Grayeyes off the ballot, the Democratic Party will have the opportunity to replace him in August with a new candidate for the District 2 Commission race in November. In areas where pale pink dirt roads meander through rural Utah on the Navajo reservation a family will often describe their residence in place-based language. In lieu of a street address, familiar landscape markers work to guide visitors to a home. Such directions work for family reunions or personal invitations, but not for mail delivery. Most families use post-office boxes for their mail. Shelby’s order created a strenuous workload for the county clerk’s office as well as local communities. But watchdog groups pitched in to help inform voters throughout the county. The ACLU of Utah provided printed flyers with details about how to identify district residencies, how to recognize ballot problems, and whom to call. They also published in-person polling locations and contact information for questions and concerns. The Navajo Nation Human Rights Commission, and the Rural Utah Project (RUP) launched voter registration drives to assist Native residents, who are now the demographic majority, as they grappled with identifying in the correct precincts and districts in which they live. T.J. Ellerbeck, an RUP coordinator, organized a campaign in San Juan County that would assure voters that their registrations were correct. They also assisted with new voter registration. The group clarified any district changes that applied to a voter’s registration, what to expect of mail-in ballot procedures, how to vote by mail or in person, and how to recognize if ballots were not correct or tampered with. The group mobilized at Navajo chapter houses, community events and health clinics, anywhere groups of people gathered. RUP recruited bilingual workers, making it possible to explain the new processes to elders and family members who speak the Navajo language when they drove to confirm residences using the description on the registration forms. Those discrepancies led to the second legal action involving the election. In April the group brought their growing concerns to the county clerk’s office. Misgivings over the incorrect registration documents and possible assignments of Native voters to the wrong precincts and districts led attorneys for six Navajo plaintiffs to file a motion June 12 requesting a temporary reopening of the Navajo Nation vs. San Juan County redistricting case. The Navajo Nation Human Rights Commission said in a press release that the county is violating the judgment in the case by failing to properly assign up to 2,000 Navajo voters to precincts under the court-ordered redistricting plans. The plaintiffs allege that the county is delaying implementing the new boundaries and updating its precinct lists, leaving the Native voters with incorrect or missing ballots. The motion calls for Nielsen to appear in court to explain why the county should not be held in contempt for failing to comply with the 2017 order. A hearing is set for July 2. James Francom, San Juan County assistant clerk, admitted that some ballots were wrong. He said that the precinct boundaries, especially around Blanding, were slightly off, affecting about ten ballots outside the city boundaries and about two city blocks inside the boundaries. Even if it was only 40, says Ellerbeck, “that could be enough to sway the results of some school board races.” In Utah any voter can participate in the Democratic primary, but only registered Republicans can participate in a Republican primary. And voters can change their party affiliation on Election Day if they want to vote in the Republican primary, he explained. Francom confirmed that the county clerk’s office mailed ballots for the Democratic primary in District 3 (there was no Democratic primary in the other districts) to all registered Democrats and unaffiliated voters in the district, because unaffiliated people can vote in the Democratic primary. Utah Lt. Governor’s Election Director Justin Lee confirmed the open primary process in an email to the Free Press. “The Republican Party in Utah does have a closed primary,” he wrote, “and only registered Republicans can vote on those races. An unaffiliated voter can affiliate as a Republican on Election Day and then vote in the Republican Primary. Francon said the office could not provide the number of registered Republican voters requesting a Democratic primary ballot for District 3, but could possibly make the number available in the future. Adakai of the San Juan County Democrats said the general election should be a lively one.